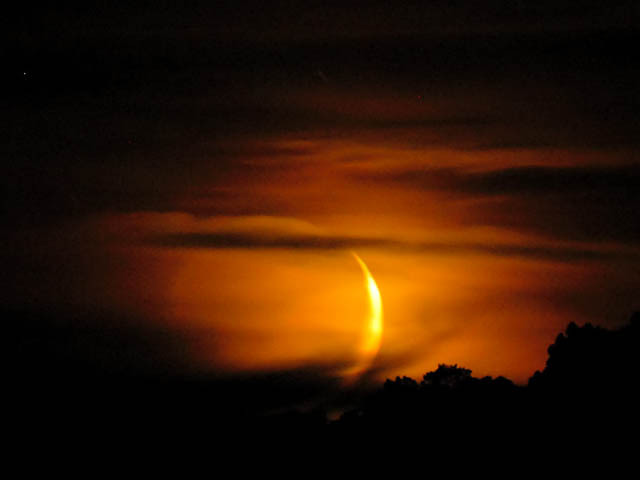 The crescent moon is 9% illuminated. 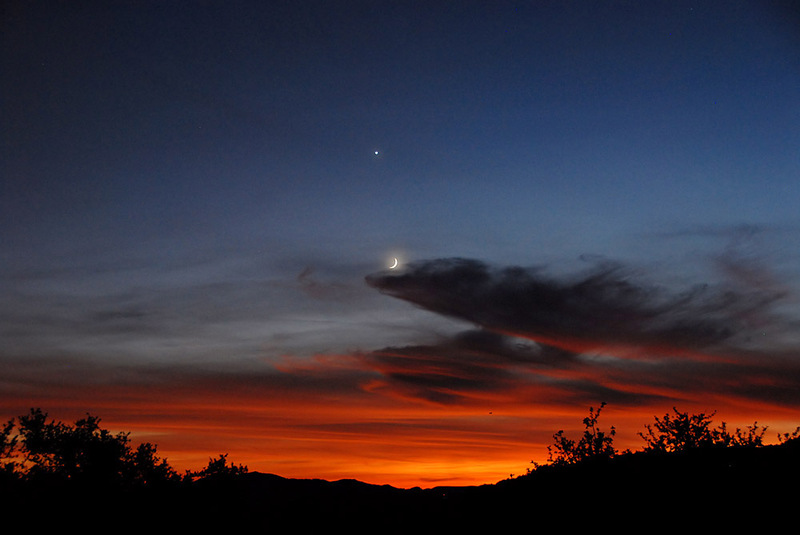 Above: Davis Mountains, October 31, 2008 at about 7:50 p.m. Nikon D200 camera, Nikon 18-200mm VR lens (tripod mounted, VR off), f4.2, ISO 400, 0.5 sec exposure. Below: Images with my Takahashi TOA 130 Telescope (a 5" APO refractor telescope), AP 900GTO mount, QHY8 CCD Camera. Other pictures from the camera are are here. 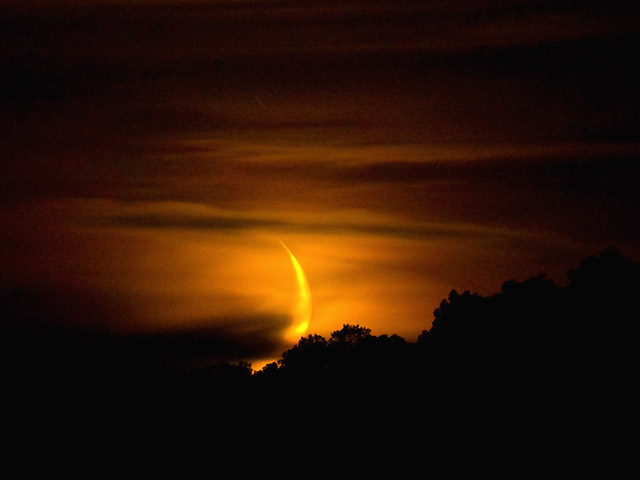 Images processed using my Astronomy Image Processing Workflow. Galaxy NGC 1365 is near NGC 55; here's a shot of that area from this trip. For US locations this galaxy is very low in the southern sky between Sculptor and Phoenix. 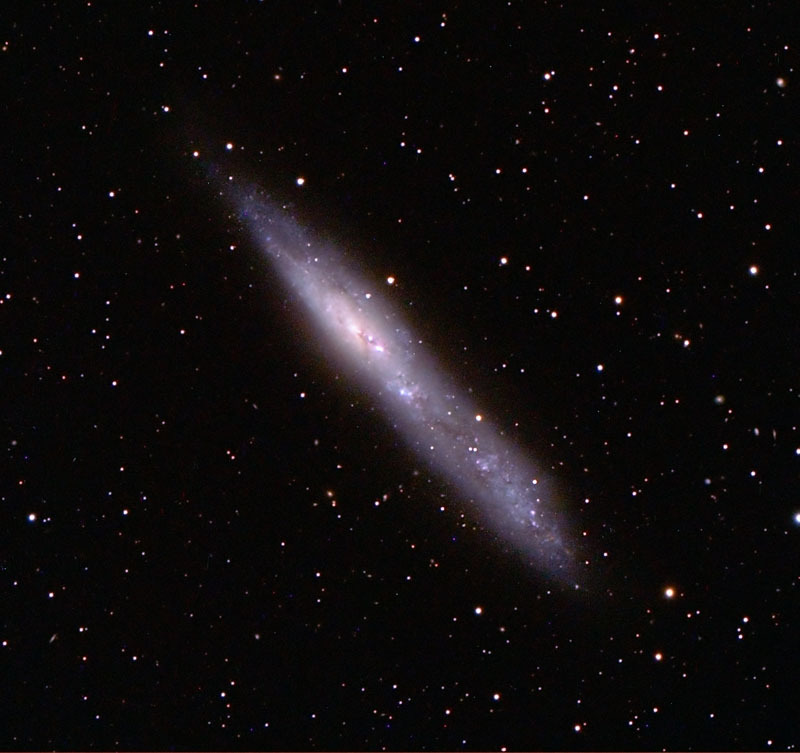 NGC55 is an irregular galaxy thought to be 6 million light years away, and a member of the Sculptor Galaxy Group. 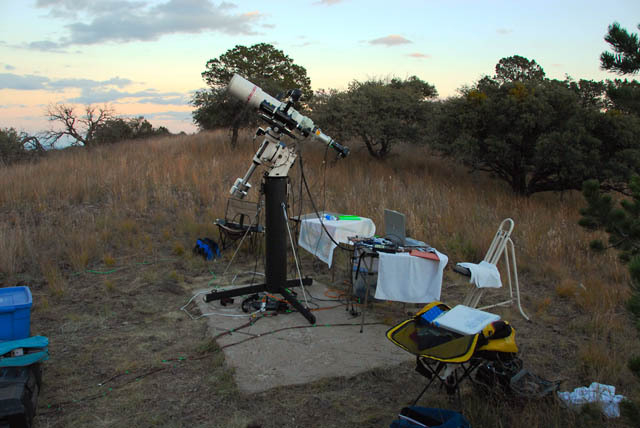 It was at most 20 degrees above the horizon during imaging and was one of the "southern challenges" I like to go after when I can. 32x5 minutes, just over 2.5 hours total exposure, with the QHY8 CCD camera. 14 x 5 minute frames with the 1.6x, 28 with the flattener, for 3.5 hours total exposure. I went a bit heavy on the cyan during processing, but I kind of like it. 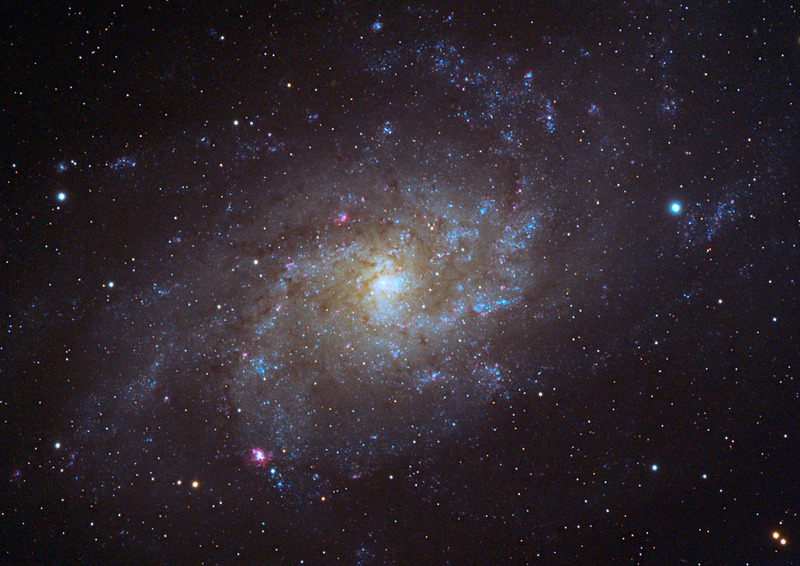 See My main M33 Picture Page and information here. 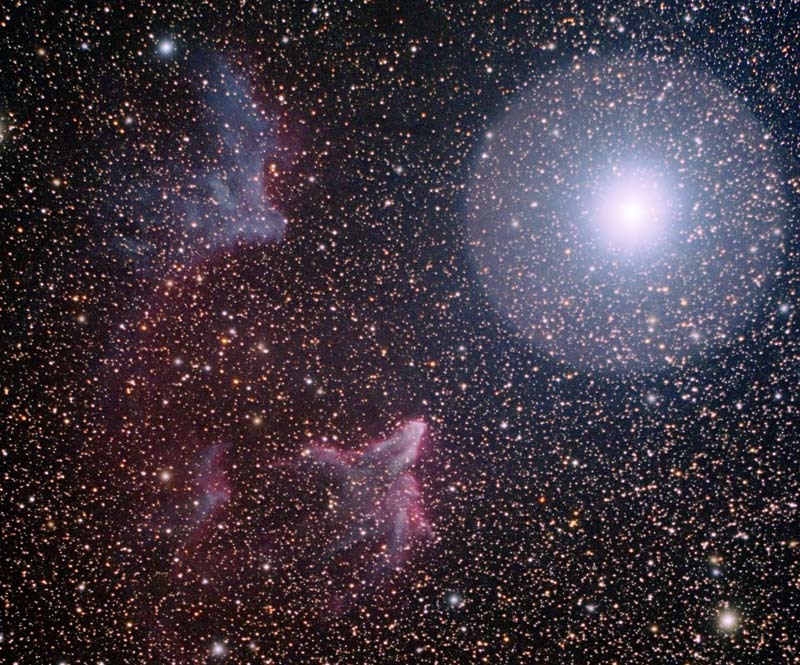 IC59 is top left and IC63 lower middle, with Navi, 27-gamma Cassiopeia as the mag 2 star on the right. 33x5 minutes, or 2.75 hours total exposures. This is very dim and you have to be crazy to try it... From October 2008, Davis Mountains. 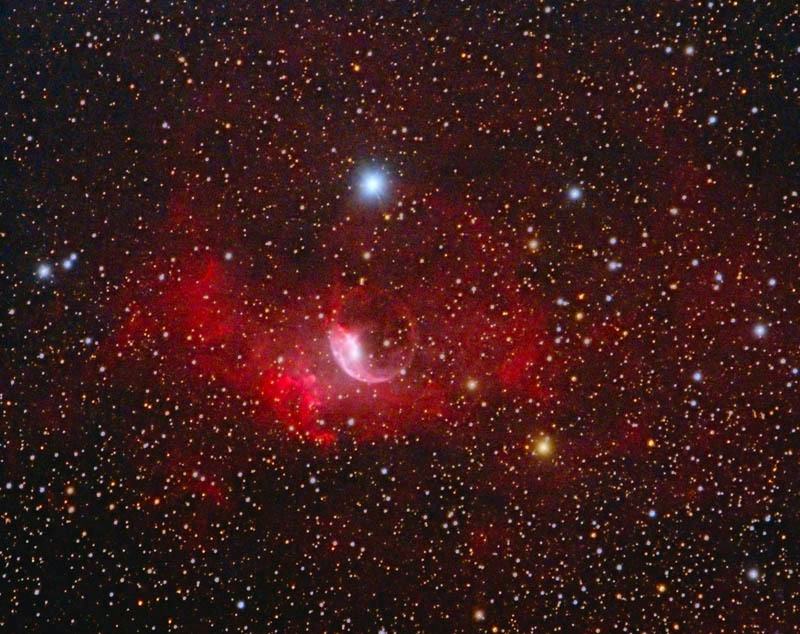 More info on the bubble nebula and this picture is here.